An Ensemble of Classifiers based Approach for Prediction of Alzheimer's Disease using fMRI Images based on Fusion of Volumetric, Textural and Hemodynamic Features, MALIK, F., FARHAN, S., FAHIEM, M. A. Variable Sampling Composite Observer Based Frequency Locked Loop and its Application in Grid Connected System, ARUN, K., SELVAJYOTHI, K.
An Automatic Instruction-Level Parallelization of Machine Code, MARINKOVIC, V., POPOVIC, M., DJUKIC, M.
A Framework for Hardware-Accelerated Services Using Partially Reconfigurable SoCs, MACHIDON, O. M., HINTEA, S., SANDU, F.
A High Optical Transmittance and Low Cost Touch Screen without Patterning, SAMADZAMINI, K., FROUNCHI, J., VELADI, H.
Golden Sine Algorithm: A Novel Math-Inspired Algorithm, TANYILDIZI, E., DEMIR, G.
An Ultra-light PRNG Passing Strict Randomness Tests and Suitable for Low Cost Tags, OZCANHAN, M. H., UNLUTURK, M. S., DALKILIC, G.
MARIAN, N. , TOP, S.
Model based development aims to facilitate the development of embedded control systems by emphasizing the separation of the design level from the implementation level. Model based design involves the use of multiple models that represent different views of a system, having different semantics of abstract system descriptions. Usually, in mechatronics systems, design proceeds by iterating model construction, model analysis, and model transformation. Constructing a MATLAB/Simulink model, a plant and controller behavior is simulated using graphical blocks to represent mathematical and logical constructs and process flow, then software code is generated. A Simulink model is a representation of the design or implementation of a physical system that satisfies a set of requirements. A software component-based system aims to organize system architecture and behaviour as a means of computation, communication and constraints, using computational blocks and aggregates for both discrete and continuous behaviour, different interconnection and execution disciplines for event-based and time-based controllers, and so on, to encompass the demands to more functionality, at even lower prices, and with opposite constraints. COMDES (Component-based Design of Software for Distributed Embedded Systems) is such a component-based system framework developed by the software engineering group of Mads Clausen Institute for Product Innovation (MCI), University of Southern Denmark. Once specified, the software model has to be analyzed. One way of doing that is to integrate in wrapper files the model back into Simulink S-functions, and use its extensive simulation features, thus allowing an early exploration of the possible design choices over multiple disciplines. 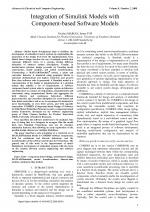 The paper describes a safe translation of a restricted set of MATLAB/Simulink blocks to COMDES software components, both for continuous and discrete behaviour, and the transformation of the software system into the S-functions. The general aim of this work is the improvement of multi-disciplinary development of embedded systems with the focus on the relation between control engineering and software engineering. M. M. Adams and P. B. Clayton. Clawz, "Cost-effective formal verification for control systems", In 7th International Conference on Formal Engineering Methods, pp. 465-479, 2005. 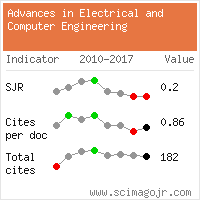 Citations for references updated on 2019-04-20 22:13 in 29 seconds. Website conception, design and maintenance by Eugen COCA. Content updated on 28 Feb 2019. Site engine updated on 28 Feb 2019. This page was generated on the server in 0.115 seconds and loaded in your browser in > seconds.